A mutual fund managed by US-based investment firm Vanguard Group has marked down the value of its stake in Flipkart by 33%, joining another investor Morgan Stanley in cutting India's largest e-commerce marketplace's valuation to historically low figures. The fresh markdown by Vanguard values Flipkart at $7.34 billion while Morgan Stanley slashed the value of its shares early this week to value the company at $5.57 billion, marking the lowest valuations the ecommerce giant has been subjected to ever since its peak valuation of $15.2 billion last year. According to filings with the US Securities and Exchange Commission (SEC), Vanguard Variable Insurance Funds reduced the value of Flipkart shares it owns to $68.7 per share as of 30 September 2016 from $102.6 at the end of March 2016. The latest valuation resetting by Vanguard lowers Flipkart's valuation to $7.34 billion from $11 billion when investment firm readjusted its Flipkart share values in March. 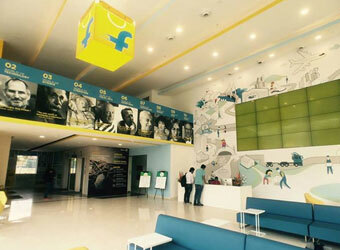 Vanguard initially acquired Flipkart shares in 2014 during its Series G fundraising and later at the time of the Series H round in December 2014. However, Vanguard values its Series G and H shares slightly differently. The $7.34 billion valuation is based on its Series G shares that are valued at $68.7 per share. Vanguard's Series H shares are valued slightly higher at $77.7 per share, reduced from $106.7 in March. During the last exercise, Vanguard lowered the value of the Flipkart shares it first bought (Series G) to $102.6 apiece as of 31 March 2016 from $136.8 on 30 September 2015. It also brought down the value of the shares it bought in the second tranche (Series H), to $106.7 apiece from $142.2. Early this week, a mutual fund managed by Morgan Stanley marked down the value of its shares in Flipkart by 38.2%, valuing the company at $5.57 billion. The fund slashed the value of its Flipkart shares to $52.1 per share as of 30 September 2016 from $84.29 per share in end of March 2016 and the peak share price of $142.2 as of June-end 2015. "Mutual fund mark-to-market is a purely theoretical exercise and is not based on any real transactions. We are seeing a strong traction in our business momentum and operating performance. We continue to be focused on innovating for the customer, growing the market and executing on our long-term growth agenda," a Flipkart spokesperson said when asked about the company's reaction to the markdowns. The development was first reported by the Mint. It is likely that the investment company may have taken into account a number of external developments including the ever-increasing competition from US-based rival Amazon, the serious slump in sales following the announcement on demonetisation and the resultant losses it suffered over undelivered cash on delivery (COD) orders. Flipkart's higher net losses in FY2015-16 could also have contributed to the sharp fall in valuation. The net loss of Flipkart Internet Pvt. Ltd, which operates Flipkart, doubled to Rs 2,306 crore in the financial year ended 31 March 2016, compared with Rs 1,096 crore in the year-ago period, according to filings with the Registrar of Companies. The e-commerce major has been battling eroding valuation as several American mutual funds have marked down the value of their investments in the firm over the course of what looked like a dreadful year for the company. Recently, two American mutual funds, Fidelity Rutland Square Trust II and Valic Co, have marked down the value of their investment in the company for the second time this year. The mutual fund managed by Fidelity Investments lowered the value of Flipkart shares it owns by 3.2% and Valic marked down the value of its investment in the company by 11.3%. The latest markdowns come at a time when Flipkart is reportedly trying to raise more funds from Wal-Mart Stores Inc, the world's largest retailer and Canadian fund CPPIB amid an intense battle with the Indian arm of US-based Amazon.com Inc to maintain its leadership in the Indian e-commerce market. It is also reported that the company is in talks with several investment banks, including the US-based Goldman Sachs Group Inc to attract investors for a new round of funding. The firm last raised funds in 2015 from existing investors led by Tiger Global. Flipkart's other investors include Tiger Global Management, Naspers, Accel Partners, Iconiq Capital, GIC, DST Global and Sofina Societe.